This second block of the month quilt in our three-part series highlights “Bad Girls of the Bible”, and is a follow-up to “Slightly Bad Girls of the Bible.” This program features familiar and not so familiar women in the Bible: Eve, Potiphar’s wife, Lot’s wife, Sapphira, Delilah, Rahab and more. Each block represents the story in which the women appear, and it’s up to you to read the stories if you choose. The pattern itself includes a brief description of the story represented by each block, and the last page of the pattern booklet provides guidelines on setting up a book study in your home or church if you have an interest in doing so. 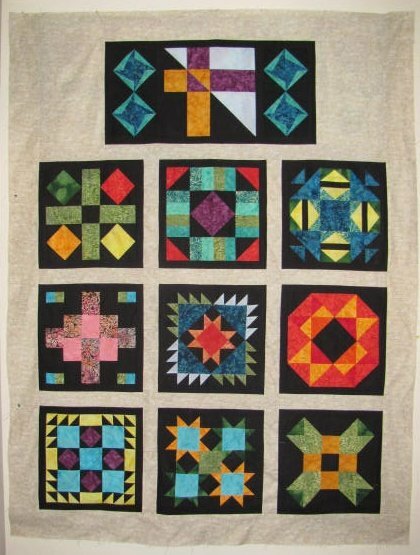 Our generous-sized lap quilt (54” x 72”) is made of premium batiks with solid black Pimatex on a limestone-brick background and encompasses both traditionally piecing and easy paper-piecing techniques. (If you’re new to paper-piecing this is a great project with which to start – super easy foundations let you see how easy and rewarding this technique can be!) Each month you'll receive the pattern + fabrics as shown on the schedules below, along with our exclusive directions for framing the windows and enlarging the quilt to the size shown (54" x 72"). Choose from the 5-month program for $ 28/month (USA), the 11-month program for $ 15/month (USA), or the full kit (available HERE). As with all our Block of the Month (BOM) programs, there's no registration fee and no extra shipping charges - everything's included in the price shown here! First kits will begin shipping in early October. The 11-month program receives the pattern and fabrics for one block each month for 10 months, with the finish kit (sashing, border & binding) arriving in the 11th month.